Administrative and general expenses for the period grew 25% to total $671.03 million (2017: $535.18 million). Consequently, gross profit for the period rose 20% to close at $170.90 million compared to the $141.95 million reported for the same period a year ago. 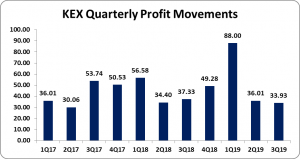 For the quarter, Gross profit fell by 9% from $41.07 million in 2018 to $37.30 million. In addition, finance income surged to $9.58 million from $1.53 million in 2018. Finance costs also climbed 33%, to total $22.15 million for the period up from $16.67 million recorded for 2018. Profit before taxation for the nine months amounted to $158.34 million relative to $128.31 million reported in 2018, a 23% increase year over year. Taxes of $400,304 were incurred this year compared to nil last year. Consequently, net profit for the period also amounted to $157.94 million, representing a 23% increase over the prior year’s corresponding period net profit of $128.31 million. Net Profit for the quarter however declined by 9% to close at $33.93 million relative to the $37.33 million booked for the corresponding period in 2018. The Company noted this was as a result of, “start-up expenses associated with our subsidiaries -KE Connect and KE Connect US. KE Connect has focused on providing connections and specialized local charters while KE Connect US, which began operations in January 2019, will target charters in South Florida market. As such, earnings per share (EPS) for the nine months ended amounted to $0.32 (2017: $0.26), whilst earning per share for the quarter amounted to $0.07 (2018:$0.07). The twelve-month trailing EPS amounted to $0.41. The number of shares used in our calculations is 500,000,015. KEX stock price closed the trading period at a price of $12.29 on April 12, 2018. Shareholder’s equity closed at $749.16 million (2018: $576.94 million). As such, the book value per share was $1.50 (2017: $1.15).